The father of two first came to Korea in 1998 to study Korean language at Yonsei University, recommended by one of his close friends from home. Then a growing interest in the country led him to consider a master’s degree in business at Seoul National University. Karagozlu would’ve been a businessman anyway, as he would be the heir to his father’s business. But he said that his interest grew more for the restaurant trade throughout the years than for textiles, an area in which his father is an expert. Today, Karagozlu operates a total of five Pasha restaurants and cafes. Some of the branches can be found at Central City in southern Seoul, the main Lotte Department Store in downtown Seoul, Lotte Department Store’s Gwangbok branch in Busan, and Hyundai Department Store in Seoul’s Mokdong area. All the Pasha cafs offer a take-out service and feature dondurma, the esteemed Turkish ice cream. A franchising license garnered in late 2009 has opened doors for the brand to spur expansion. Supporting the expansion plans is the launch of a processing plant set up in Seongnam for all the ingredients and products, including the ice cream, for distribution. Launching the business was not as smooth and easy as had been expected. “It was more difficult than I had expected because I was not as familiar with the laws and regulations as a local businessman would be, while cultural differences also posed obstacles,” the chief executive officer of Turkuaz Co. Ltd. confessed. 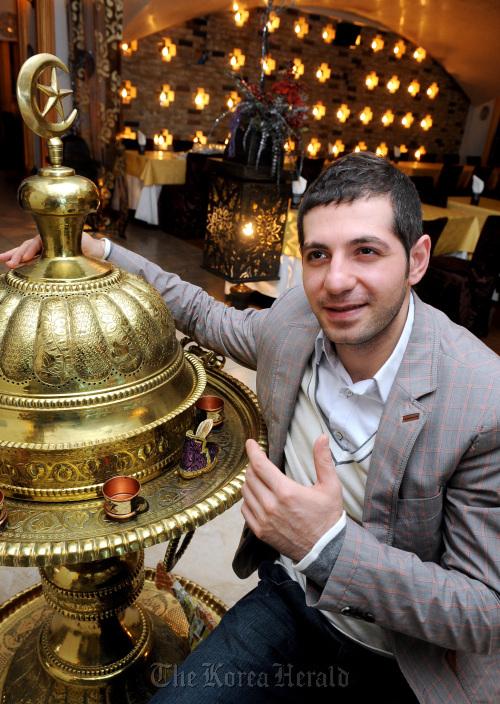 In the beginning, the first Pasha restaurant didn’t attract many customers, Karagozlu recalls. He confessed the growing process of this first branch took four years, a rate slower than the industry average. He blames this sluggishness on lack of experience. Two years ago, however, this main branch in Seoul’s trendy Gangnam area gained the ability to move to a bigger floor space in the building next door. It now occupies a floor space of 858 square meters and can accommodate up to 300 people. The initial business operated with a floor space of 297 square meters. The new, bigger Pasha in Gangnam offers a complete Turkish experience from the diverse food menu to the ambiance and facilities that include a water pipe room. Even though Karagozlu was a rookie in the restaurant business and his initial attempt was on foreign soil, the ambitious entrepreneur is committed to building his brand. “I plan to invest continuously, and I aim to build the brand so that everyone in Korea recognizes it,” he said. “Before I started all this, my dream was smaller, but all the positive response so far has been encouraging me to keep on going and have a bigger dream,” he said. Considering such a result came through trial and error, it is a big achievement. By the end of 2011, the Turkish restaurateur hopes to have a total of 30 Pasha restaurants and cafes in Seoul and the surrounding areas. While Karagozlu has played a role in setting a positive example to his fellow compatriots and expatriates from other countries in Korea, he says he relishes the opportunity to fuel a Turkish cuisine trend here. For more information on the Pasha Turkish Kebab House, log onto www.pashakebab.com, or call (02) 593-8484.